Because they are both filter feeders and sedentary, oysters tend to take on the flavor and character of their environment. Many market savvy oyster growers before us have borrowed the word terroir (derived from the Latin terra or land says Wikipedia), which is used by vintners and wine enthusiasts to describe the connection between wine and the environment in which its grapes are grown. For a marine delicacy like the oyster, the more appropriate derivation is merrior (mer or mar meaning sea in the romance languages). To all of this, we say “Va bene!” and we agree that the look and taste of oysters say a lot about how and where they are grown. Wildlife abounds, and we enjoy frequent visits from harbor seals and osprey, and the occasional flyover by bald eagles. Our farm is located on the western shore of Little Bay within the Great Bay system. The fast, cold waters make farming challenging at times. In fact, the Piscataqua River is home to the strongest tidal currents on the east coast, pumping untold gallons of salt water into Great Bay twice each day. Our oysters are literally shaped by this environment (the merroir of Great Bay), deeply cupped by the rolling action of the tides and brimming with salts delivered from the Atlantic. 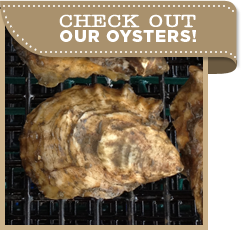 Every one of our oysters is grown to full maturity in cages that sit just a few inches above the sea floor. This leaves the oysters incredibly clean and strong shelled by greatly limiting access by the many creatures that might want to call an oyster shell home. We are able to visit our oysters often, keeping them free of colonizers. The result is a classic, deeply cupped oyster shape that looks so inviting on a bed of shaved ice. It’s an infrastructure and labor-intensive approach, but using these techniques in Great Bay will allows us to deliver a consistently clean, appealing, and delicious oyster.